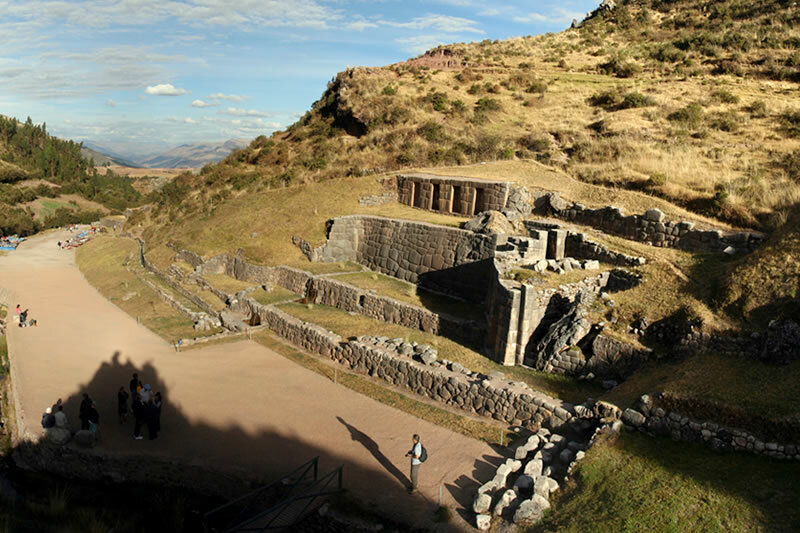 The archaeological complex of Tambomachay is also known as the Baños de Inca, and is one of the most important Inca buildings; This is due to the great mastery and the incredible work with the stones that form its walls. It has an astonishing subterranean hydraulic system, and this is very simple to explain, the Inca civilization revered the water as a life-giving deity. Tambomachay is located 7 km from the city of Cusco very close to Sacsayhuaman; Is considered one of the first “ceque” shrines (enormous imaginary lines, which served to organize shrines and huacas in the vicinity of the Antisuyo, departing from the city of Cusco). The word comes from the Quechua words Tampu (collective lodging) and Mach’ay (resting place). But other studies indicate that the word “machay” would mean “caves”; Which would explain the peculiar natural rock formations. In the Inca civilization, these cavities are considered as means of connection with the world of the dead. It is a set of three parallel platforms. In the last of them stands a wall 15 meters long by 4 feet high adorned by 4 niches. The blocks of stones have been fitted perfectly. The water reaches the lowest level through subterranean channels. In this place, two manantes maintain a constant flow of clean water, that comes from another well in a higher level. A similar system in what can be seen in the stairs of the fountains in Machu Picchu. When you look at the monument from the river, you can see two thick walls that cross the support wall. The closest to the river has two large niches and the second, perpendicular to the first, has a double jamb door. This gate was used by the Incas to highlight the importance of a building. This door leads to a small room where it looks like the water that comes out of the ground. The chronicles of the conquest say that Tambomachay was the hunting zone of the Inca Yupanqui; So that the place would be flooded with numerous animal species. It is possible that another of its functions, would have been to provide water to the growing areas of the Inca site known as Puca Pucara. The Incas worshiped water as a source of life. Tambomachay has an extraordinary hydraulic system. Two underground channels carved in detail on the rock carry a constant flow of clean water throughout the year; This one comes from a pozo located in a higher level, and pours its waters in a small pozo of stone located in the lower level. 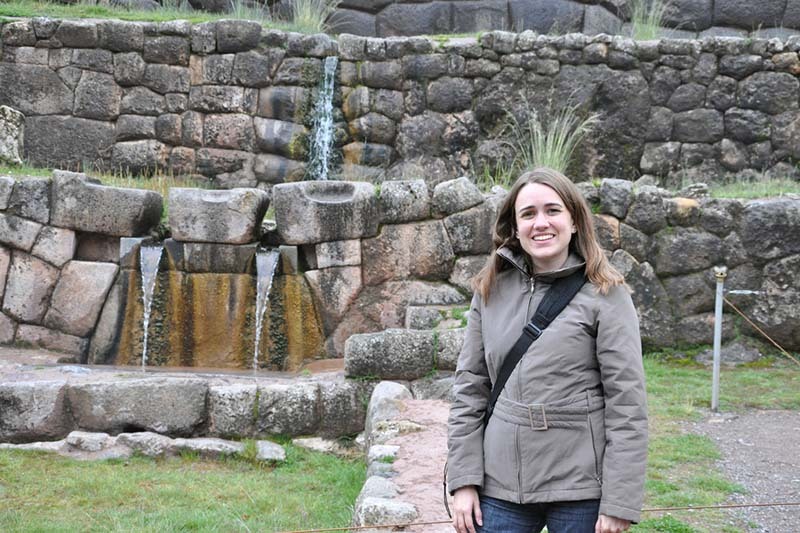 This pool had to be a ceremonial source, in which the Inca and his court worshiped the water. The bathrooms of the Inca are very similar to the enclosures located in the city of Ollantaytambo. Although today it is a work to the open, many of its foundations indicate that it would be a closed enclosure. It is entered through double jamb trapezoidal platforms. From the bank of the river it is possible to observe thick walls that cut the wall of support. One of them has 2 large niches; The second, perpendicular to the first, has a door with double jamb. This type of door was used to highlight the importance of a place. This door leads to a small room in which it is possible to see the water that comes from the bowels of the earth. Even now, specialists have not been able to determine the source of the spring from which flow so clean and abundant waters. Some believe that they could come from the opposite bank of the river. The gentle noise of the flow of water produces peace in the environment; The peculiar shape of the space in which it was built, gives Tambomachay an atmosphere of tranquility. In addition, it is one of the best examples of the skill of the Inca architects, to preserve the harmony between the constructions and the landscape.